Matthew 5:23-24: "Therefore, if you are offering your gift at the altar and there remember that your brother has something against you, leave your gift there in front of the altar. First go and be reconciled to your brother; then come and offer your gift. In any case, in the Scripture above Jesus is pointing out the hypocrisy of someone coming to worship God and make things right with Him when the worshiper knows full well that he or she has wronged someone and has not yet made things right with him or her. Notice that Jesus doesn’t forbid the worship – he tells us to leave the gift at the altar – but he stresses the utmost urgency of both the worship and the reconciliation. We are to immediately go to be reconciled to the one we have wronged and then promptly come back and offer the gift that we left there. 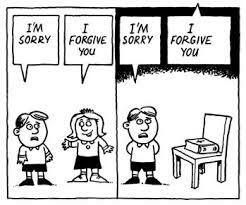 It’s almost as if the reconciliation with our brother or sister is a part of our worship of God. Our relationships with other people, then, do have an impact on our relationship with God. Before we can be right with Him, we have to be right with others. Jesus implores us today, be reconciled to whomever you have hurt and then go be reconciled to God. If you have said hurtful words to someone, go and apologize. If you have spread gossip and half-truths about someone, go confess it and ask for forgiveness and set the record straight. If anyone has anything against you, go and offer compensation or your help or whatever it is you have to do to make things right between you. And if someone has hurt you, be quick to forgive. When you open the door of your heart to forgive others, God uses that same door to extend forgiveness to you. Jesus died not only for you, but also for the one you sinned against and the one who sinned against you. Be reconciled one to another, and then be reconciled to God through the cross of Christ. To be a part of the conversation about the article above, or even if you just want to read what everyone else is saying about it, go to the Be Reconciled Comments Page. This article is Day 11 of the 40 Day Devotional; the next devotional is Day 12.